When I think of bugs from the States I think of fireflies I used to catch in Jersey, rolipolies that I'd poke to see them bunch up, ladybugs I'd scoop into my hands.... all innocent and fun little critters. But in Korea, or at least in Seoul, the bugs are not of the cutesy kind and more of the plague-and-scourg kind. This includes tiny fruit flies that fly out from your trash can or sink drain, cockroaches that suddenly scurry out from dark corners, and of course, can't forget the mosquitoes that come to prey every summer. In any case, to add to all of THAT insect fun, I recently opened up my rice bin (which, might I add, is LOCKED IN AN AIRTIGHT PLASTIC BIN CONTAINER) only to discover some new friends crawling around. 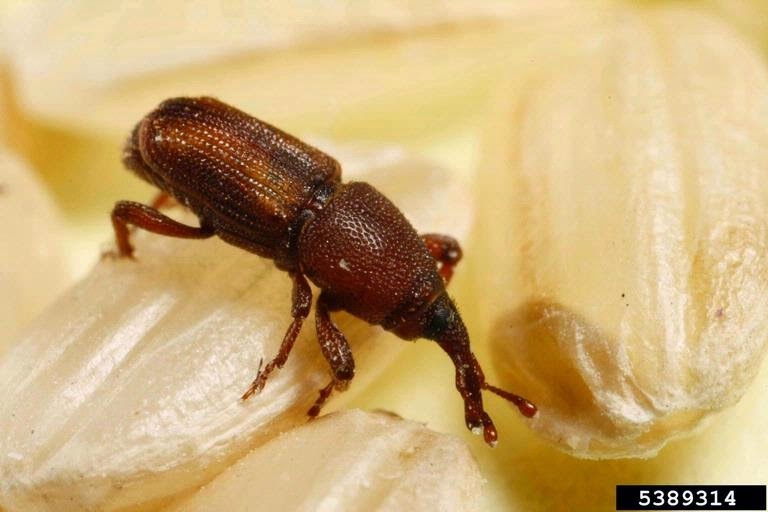 For my friends outside Korea who have not encountered these fellas before, please allow me to introduce the rice weevil or sitophilus oryzae (perhaps a random trivia question you'll be asked one day). Known in Korea as "bah-goo-mee" (바구미), these tiny critters infest things like rice, grains, and other crops by eating through grain kernels while female ones even lay eggs in them, which then hatch and repeats a wonderful cycle. Funny thing is, a few years ago I had my first encounter with these guys when I first noticed one or two of them sometimes crawling around the kitchen. Thinking they were like baby cousins of the rhinoceros beetle, I actually used to think they were somewhat cute and endearing back then. But when I cooed and showed them to my friends, they all looked at me like I was crazy and told me to check my food supplies. Lo and behold, these guys were holding a party inside my rice stock without me knowing. Since then, it's been a near yearly battle as I try and prevent these guys from getting into my food supply. Specifically it's my rice supply which seems to be the perpetual victim. Ever since my first encounter years ago, I've learned to keep my rice in airtight, lockable bins which have prevented most infestations. I've heard freezing the rice kills them while my grandma says the best way is to spread the rice out in the sun and they'll start scurrying away so you can pick them out. 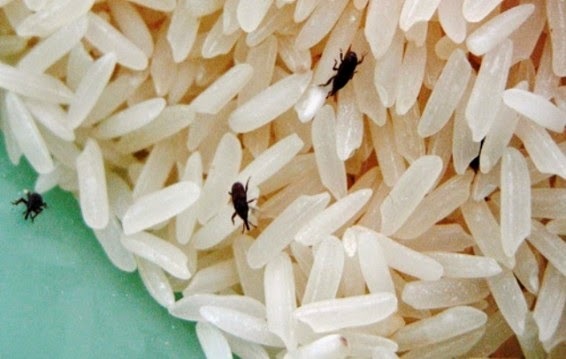 The good news is I'm down to my last few cups of rice and the rice weevils and any bad rice kernels float to the top when I'm washing the rice but man, if any of you readers are planning to move to Korea, make sure to keep a wary eye on your rice and grains and store them properly. I've been making some tweaks around the blog lately. You'll notice past entries are now listed on the right side of the blog page for easier navigating. I've also gone through each and every blog post to insert jump breaks. Why that never crossed my mind before is beyond me. Now the blog should load faster and without heavy lags and denting your data if you're going through the blog by phone. Lastly, I've had to change my Instagram account since it wasn't linking properly. The Instagram account is just a page of excess to show random eats and cooking stuff I come across in my daily life since writing up a blog post for everything is too time consuming. 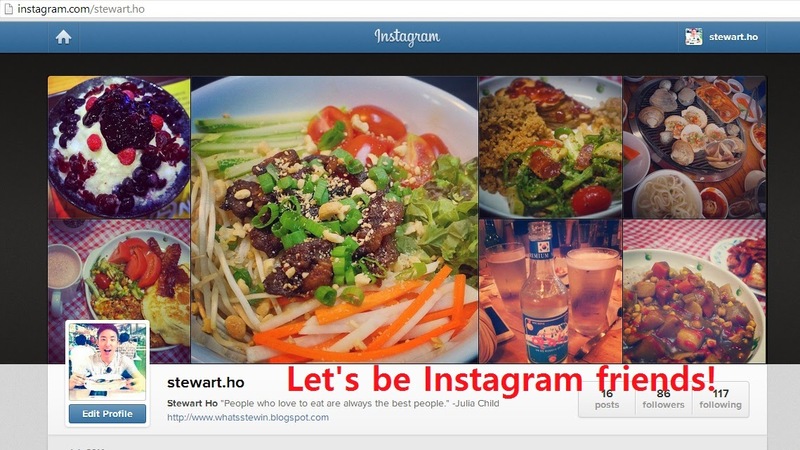 If you want to be friends on Instagram, please add me by clicking here! I didn't want to spam my personal FB with food pictures and annoy my friends so it's linked to this blog's own FB community page which I created long ago but without really knowing what to do with it haha. If it's easier to follow on FB and not Instagram, click here! I've been focusing and self studying a lot about interior design of restaurants and cafes and this gorgeous list of 25 beautiful coffee shops around the world makes me want to jump on a jet and hit up all these places right now. And lastly, it's not just Koreans who love a good bowl of nengmyeon, crabs do too! It's only when you're moving one realizes just how much stuff you amass over time. This goes of course with clothes, books, and the likes but it also goes for food too. I've accumulated somewhat of a "mini-Costco" over the past two years and, in addition to trying to get rid of food from the fridge, I've been trying to get rid of my food stockpile- a hodgepodge of tea, soup mixes, canned goods, chips, beef jerky and other random things. My friends have even joked in the past that if Seoul ever comes under war or some major disaster, they should run to my house since it's so stocked up on the edibles. Part of the reason I've accumulated so much food is because I'm not a snacker in general but another major reason is because I tend to want to save it for an occasion or group gathering. Unfortunately, as I've been reminded yet again as I try and pack everything, this thinking simply results in food being thrown out. Strangely enough, in many ways my mind and heart have become reflective to the state of my current house- there simply are too many things that I should have either used up or thrown away in the past that I've instead held onto for far too long. Just as one's home should be a place of rest, peace, and comfort, so too should be my heart, mind, and soul and a part of that involves learning to let things go and start things simple and afresh. And as I'm packing and prepping for the big move, I've come to realize I still struggle with learning to let go. The past few years have been filled with some painful and sobering moments, and I've struggled with letting go of those uglier happenings and memories from the past. Instead, they've often festered and manifested into uglier ways such as suffering from reoccurring nightmares haunted by the ghosts of yesterday. And for this reason, as much of a pain it is/will be, I'm actually looking forward to this move. By letting go of all the accumulated physical baggage/crap and trying to condense life back to the basics, I'm hoping that practice will extend internally so I can free my self of the mental shackles and downers of the past. 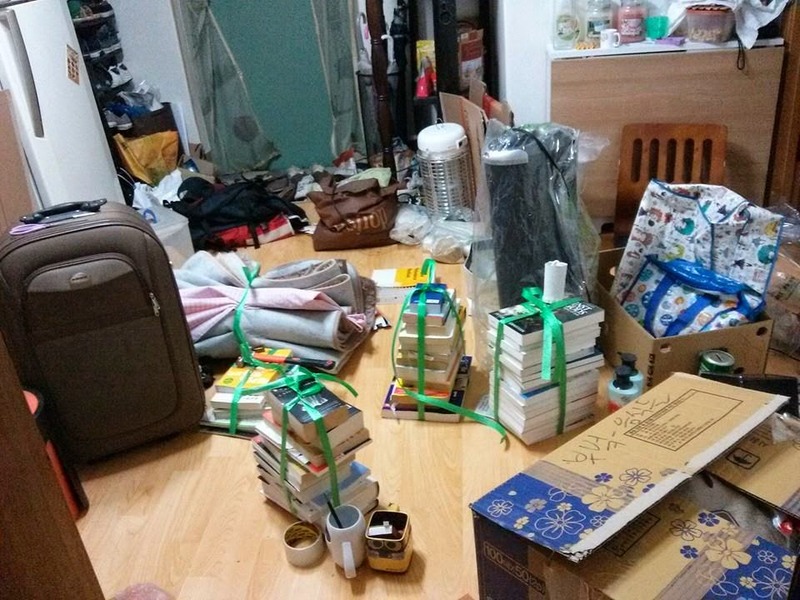 So far, I've already amassed a mountain pile worth of clothes, books, food and other things I'm planning to throw out or donate and, like a stream that's beginning to trickle through a blocked wall of stone, I'm feeling a catharsis. If anything, it's dawned on me that the practice of filling up space, whether external or internal, with "things" is not a measure of the richness of life. Rather, it's how, and in what ways, I'm applying myself in that freed up space. So wish me luck in both my resolution and in my move! Here's to the body, mind, and home not simply being vessels of life but a place where life thrives! You have a very interesting blog with good insight of your life in Korea; it definitely give me ideas for my trip end September. 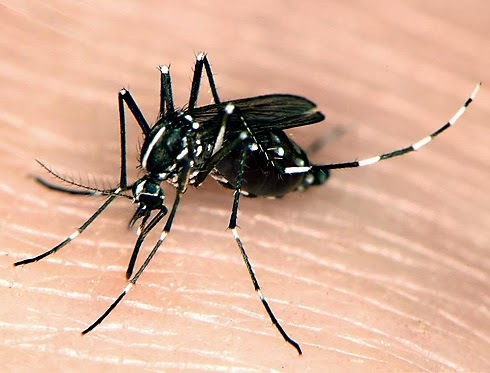 Just to let you know, that is Aedes mosquito and you are right that it transmits disease like dengue fever.